Sherlock Holmes currently holds the Guinness World Record for most frequently portrayed fictional character in film or television – over 70 actors have taken on the role of the world’s greatest detective, from Basil Rathbone to Jeremy Brett to Michael Caine to Benedict Cumberbatch. There are currently two contemporary television properties (Sherlock, Elementary) and a feature film series (starring Robert Downey, Jr.) focused on the character, but we’re about to add yet another Holmes adaptation to the list – a big screen adaptation called Mr. Holmes directed by Bill Condon (known most recently for his work on The Fifth Estate and several of the Twilight films) has just gone into production. The movie will offer a slightly different take on the tale of the great detective –and will be set during the twilight of his life, as he battles old age, dementia and a growing obsession with an unsolved case. The great Sir Ian McKellen is set to play Holmes – yes, get the screaming out of your system now; it is perfect casting – as he grapples with the diminishing powers of his singular mind. Filming officially gets under way this month, and we now have our first look at McKellen as Holmes (though there doesn’t appear to be a deerstalker in sight, sadly). Take a look for yourselves below. For some unfathomable reason, the title of the film has been changed to simply Mr. Holmes, though it’s still an adaptation of Mitch Cullum’s novel A Slight Trick of the Mind. The story is set in is set in 1947, when Holmes is 91 and has long been retired in Sussex with only his housekeeper and her son for company (and, well, presumably, his bees). He is haunted by an unsolved case from fifty years ago, of which he can only remember fragments: a confrontation with an angry husband, a secret bond with his beautiful but unstable wife. The story will toggle between decades, depicting Holmes in retirement and as he works on his last case. Academy Award nominee Laura Linney will play Holmes’ new housekeeper Mrs. Munro. 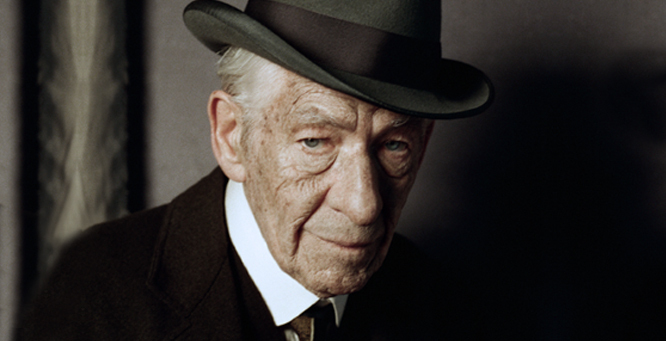 What do you think about the prospect of McKellen playing Sherlock Holmes? Do you think he looks the part? Watch the trailer for ‘The Guernsey Literary and Potato Peel Pie Society’ now! Watch the trailer for Dan Stevens' new movie - a horror film called "Apostle". Watch Helen Mirren in the trailer for upcoming horror film "Winchester: The House That Ghosts Built"